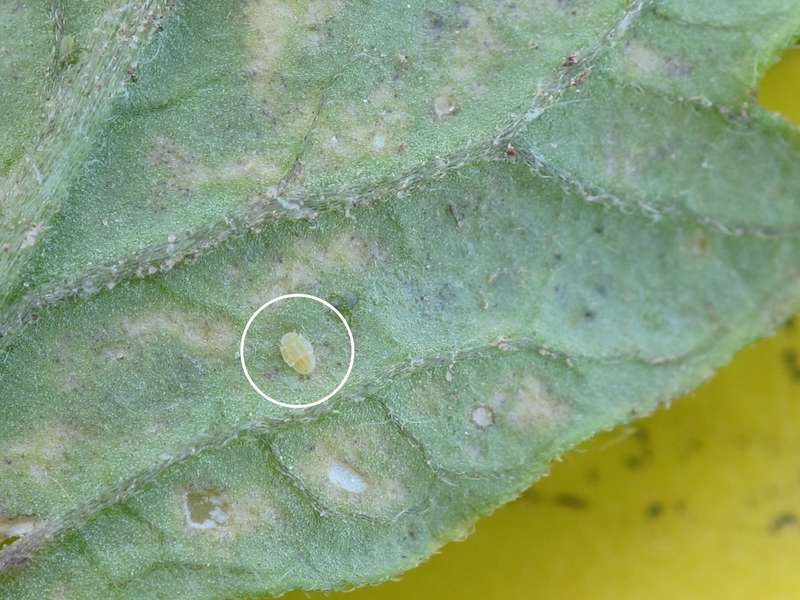 Psyllid nymphs have been detected on a tomato plant in Kaysville. 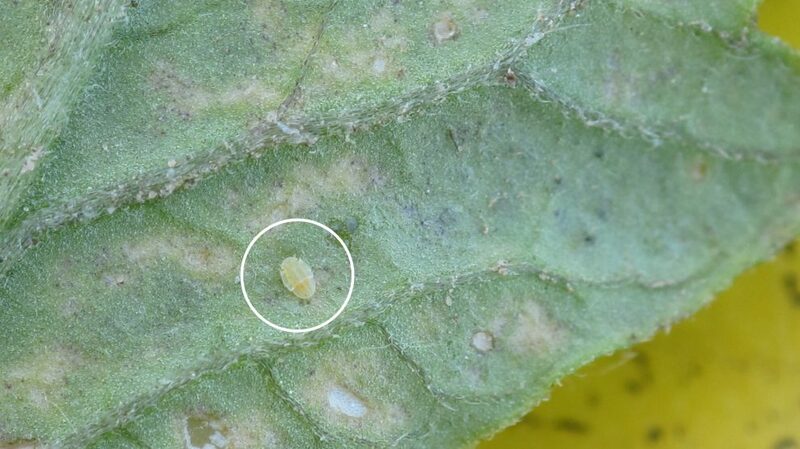 Tomato/potato psyllids excrete toxic saliva during feeding that causes what is known as “psyllid yellows” in tomato and potato plants. 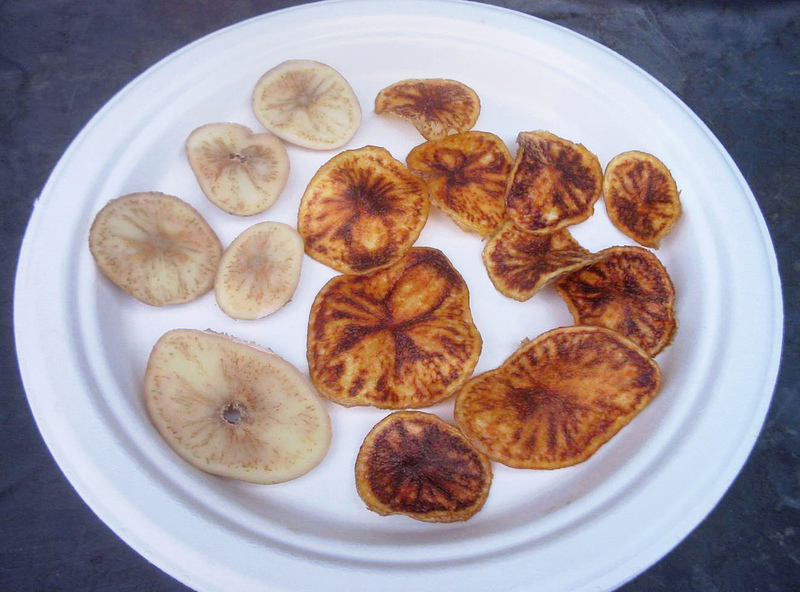 Psyllids also vector zebra chip disease which significantly impacts potato production. 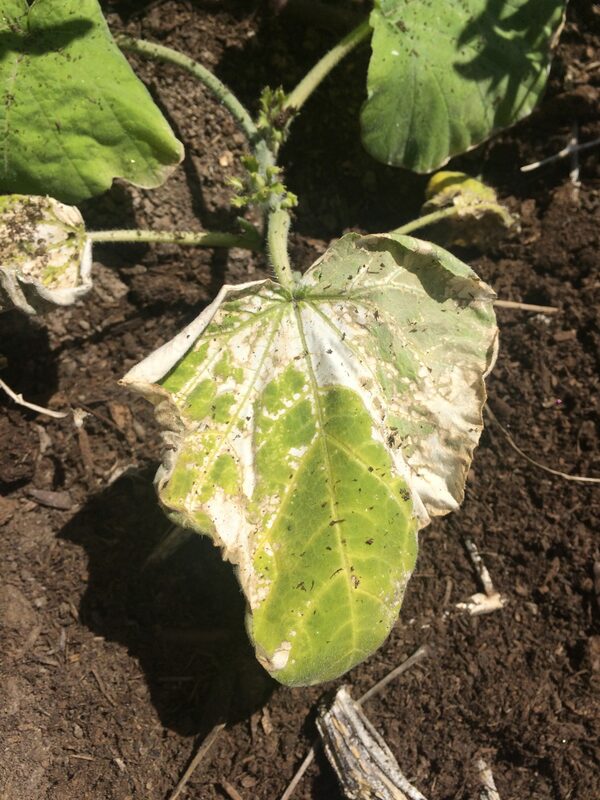 Psyllids occur on other solanaceous plants such as eggplant and pepper, but damage to these crops is insignificant. 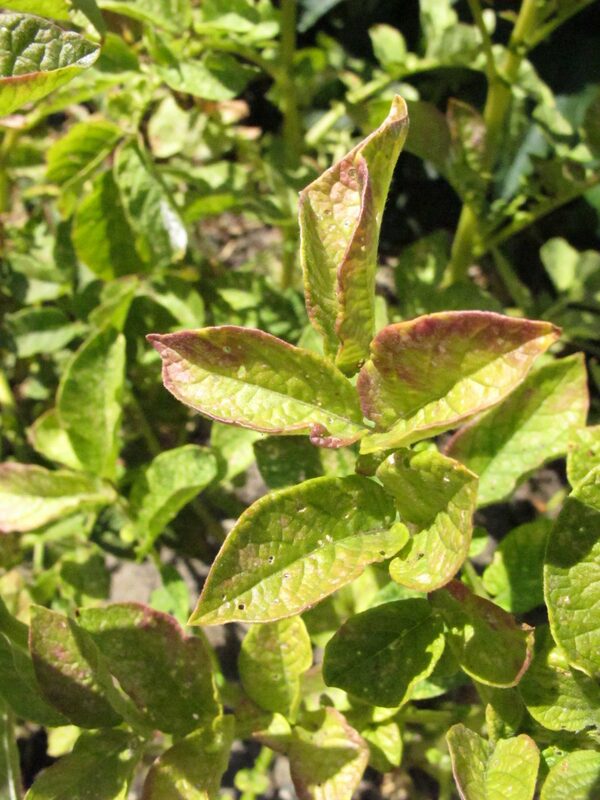 Symptoms on potato and tomato plants first show up as slight discoloration (yellowing or purpling) along the midribs and edges of the top leaves, which also tend to curl upward. 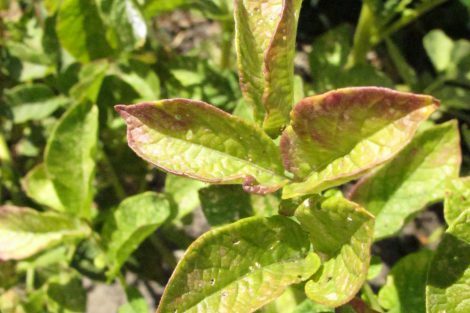 As the condition progresses, the entire plant top changes to a yellowish-green or purple-red color. The leaves remain small and narrow and tend to stand upright, giving the top of the plant a feathery appearance. 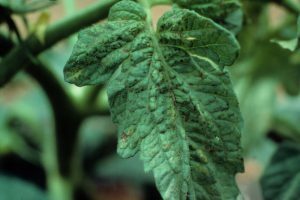 If tomatoes experience attack early in their development, feeding damage may be so severe that no fruit sets. 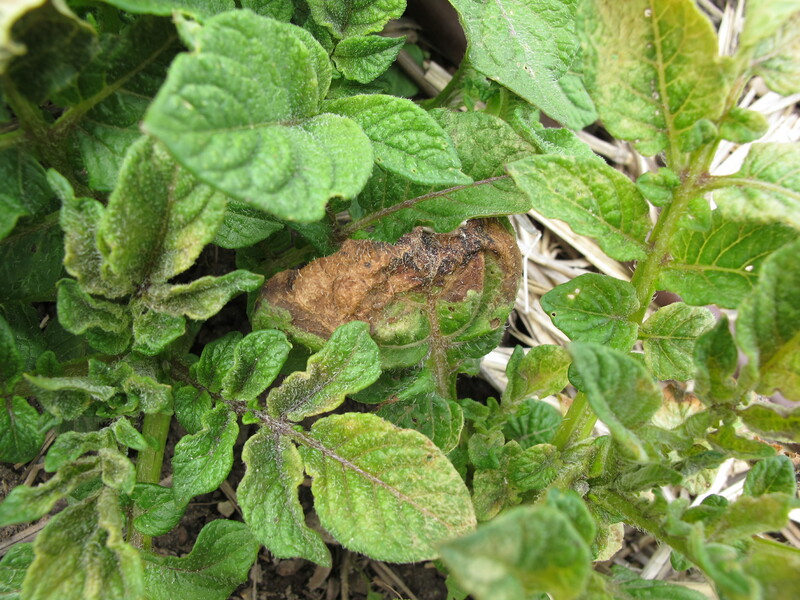 If attack comes late, tomato plants are inclined to produce an abnormal number of fruits that never attain a desirable size or quality. 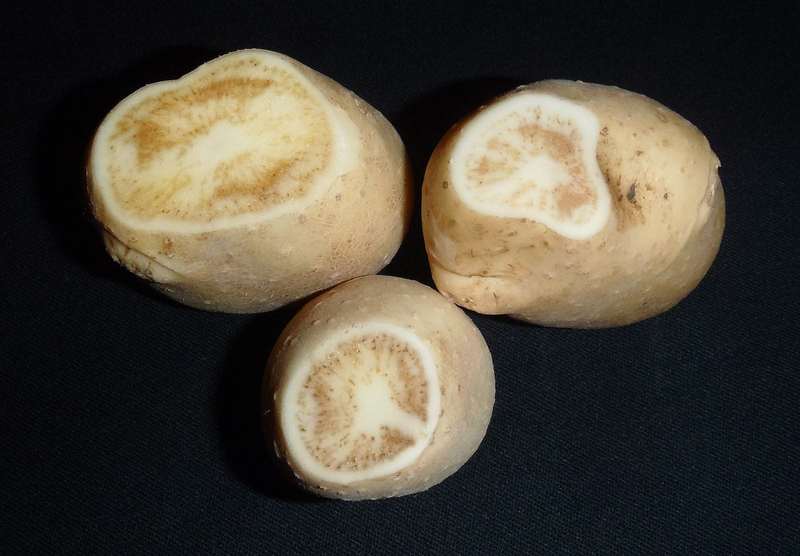 Early attack in potatoes will likely cause the formation of numerous tubers on each stolon. Attack that occurs after tubers are partially developed usually results in greatly retarded growth and irregularly shaped potatoes. 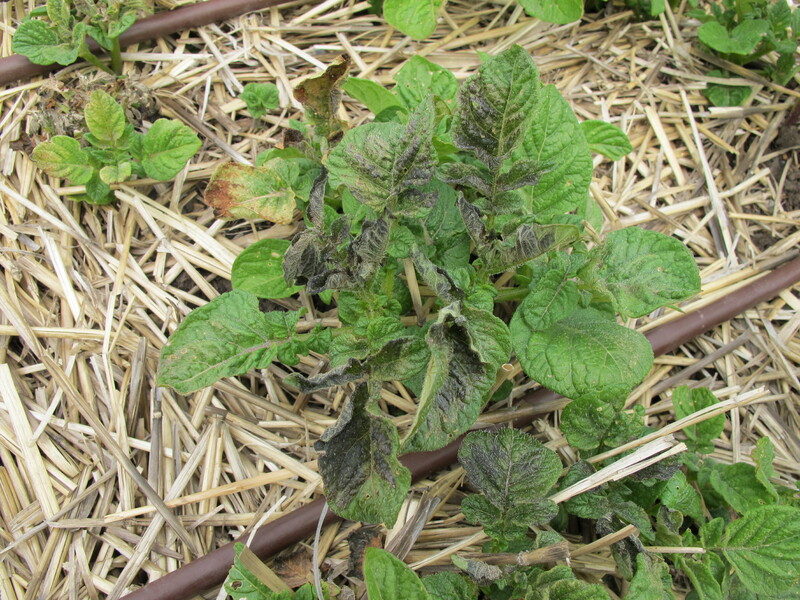 Potatoes from infested plants may sprout prematurely, even underground before harvest. There are no above-ground symptoms specific to zebra chip disease. 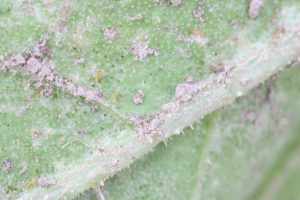 If psyllids are detected along with the discolored foliage of psyllid yellows, there is a high chance that the zebra chip bacteria are present. 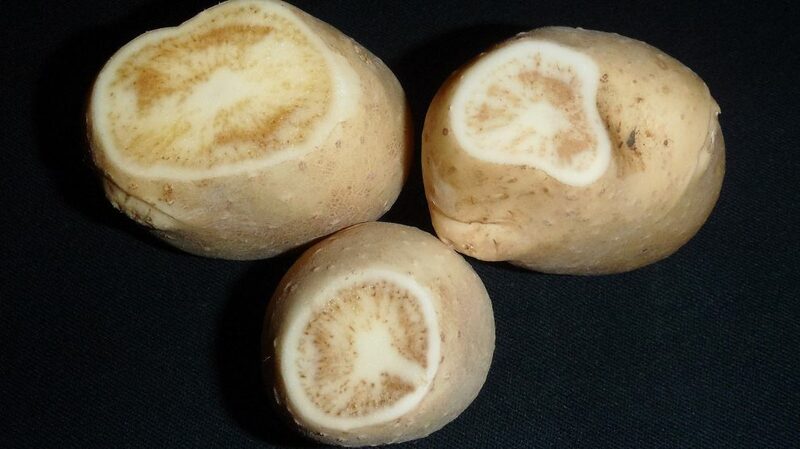 Below-ground symptoms on potato tubers are only visible when they are cut. 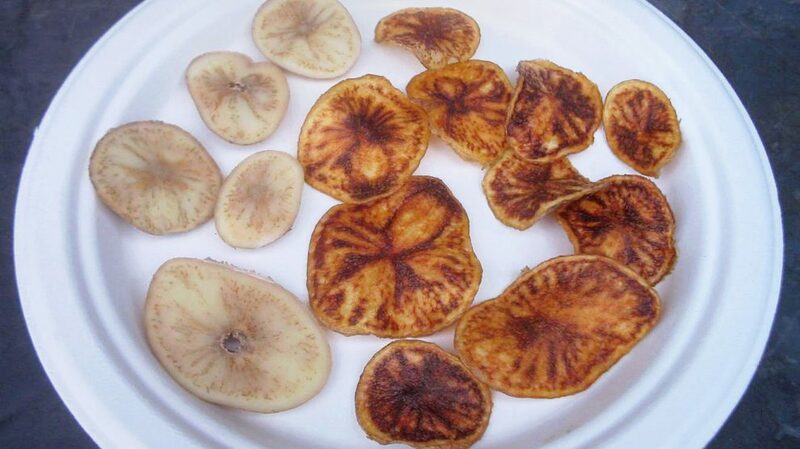 The vascular tissue in the tuber has a brown discoloration which becomes more pronounced when potatoes are fried. Management options are very limited. 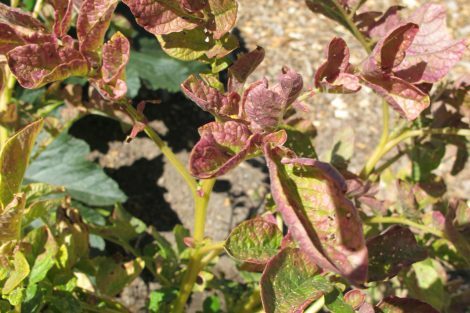 Control potato psyllids early in the season. 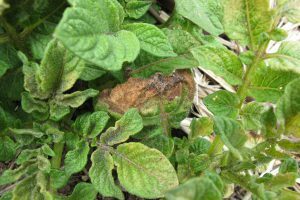 Early detection of potato psyllids is important. 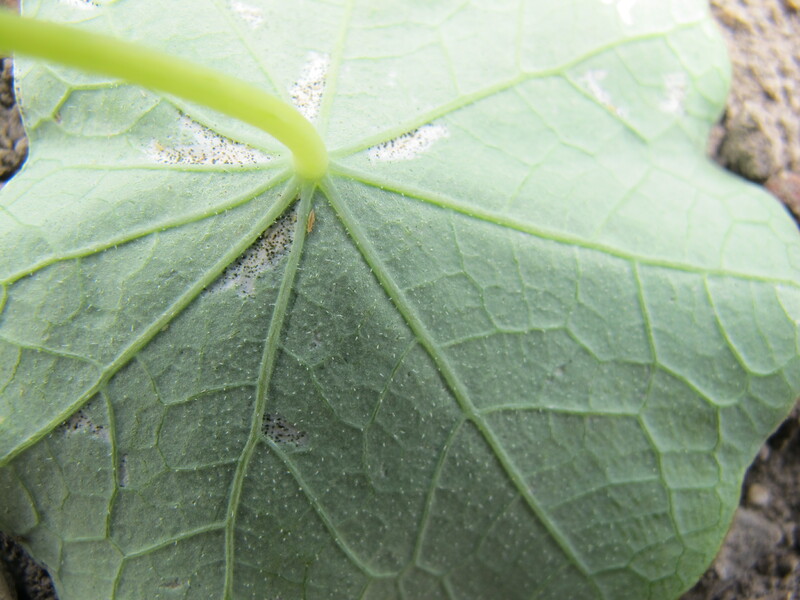 Look for psyllids on the underside of host leaves. A hand lens helps to see them. Use yellow sticky cards to attract adult pysllids for monitoring. 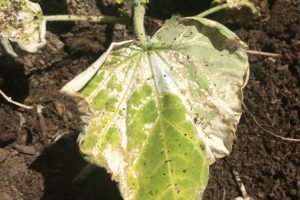 If psyllids have caused zebra chip disease or psyllid yellows in past years, or if nearby fields are experiencing these problems, several insecticide applications may be required to reduce psyllid populations. 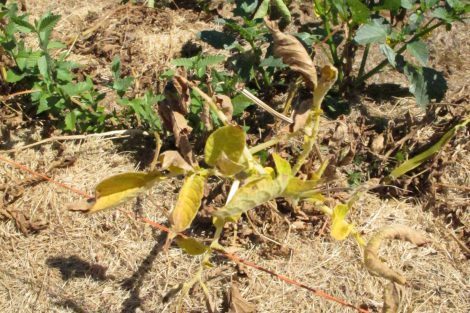 Because tomato/potato psyllid is a non-native pest, natural enemies have not been very effective to-date. 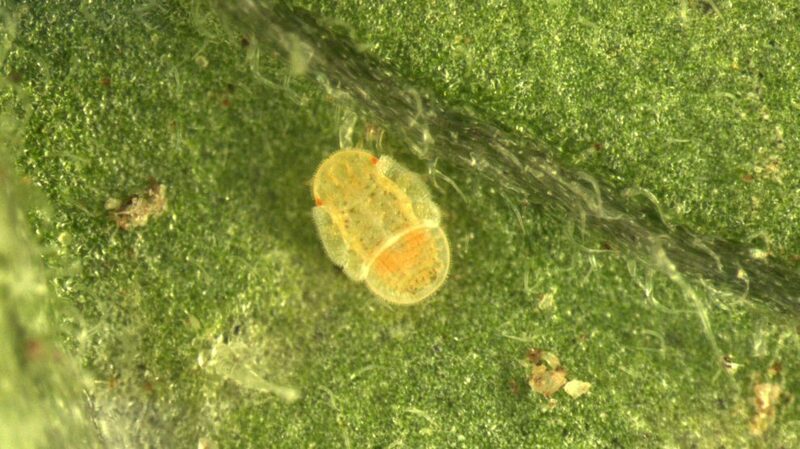 Predators that feed on psyllids include lady beetles, lacewing larvae, and minute pirate bugs. 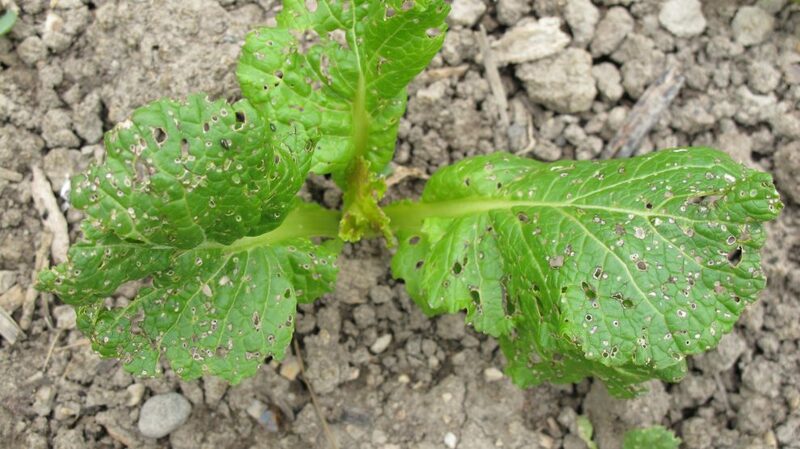 Thrips have been seen on several vegetable hosts including onions, potatoes, mustard greens, and tomatoes. 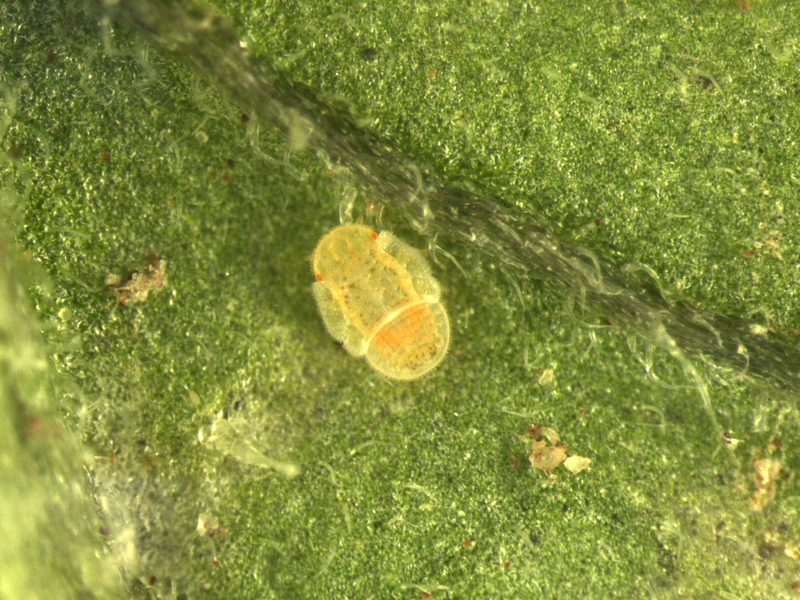 The two most common species of thrips in Utah are the Western flower thrips and onion thrips. Both Western flower thrips and onion thrips vector Tomato spotted wilt virus (TSWV) in solanaceous crops. 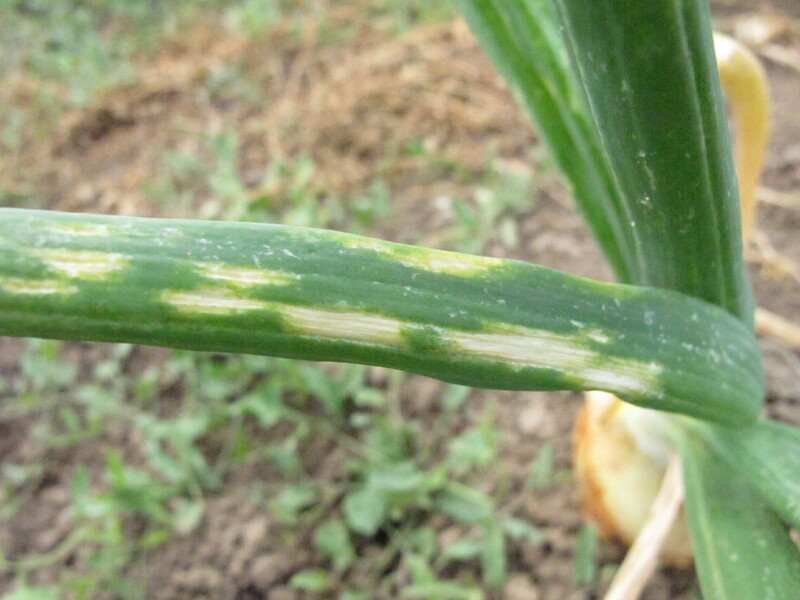 Onion thrips also vector Iris Yellow Spot Virus (IYSV) in onion crops. 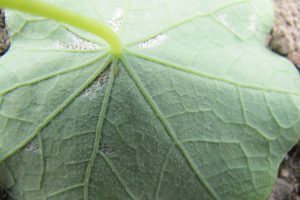 In addition to virus transmission, thrips will feed on leaves, developing buds, flowers, and fruits; and if populations are high, can cause economic loss. 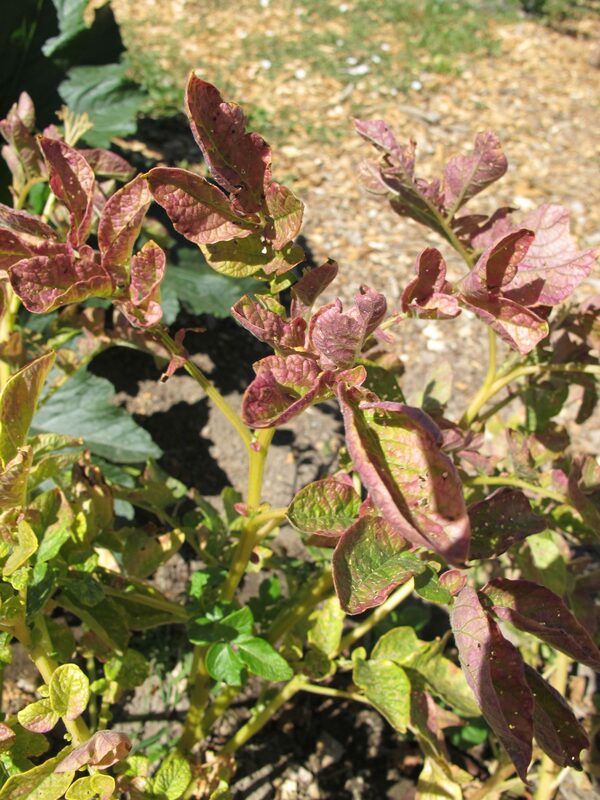 Typical symptoms are “rasping” and stippling injury on leaves, and stunted buds, flowers, and fruits. 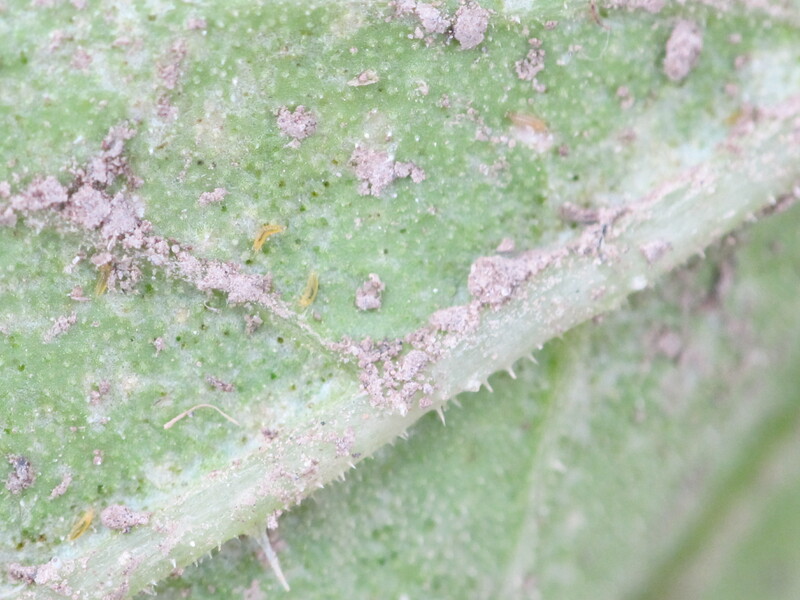 Thrips feeding on the surface of well-developed fruits can cause scarring. An abundance of dark tarspots of thrips frass can contaminate fruits. 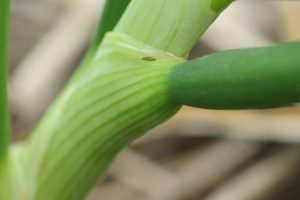 Remove or destroy volunteer onion plants or debris to eliminated overwintering hosts for thrips. Inspect transplants for thrips infestation and discard infested onions. 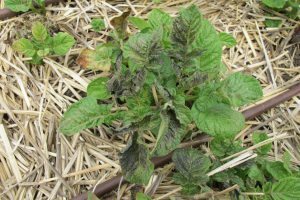 Mulch with straw or other plant materials to suppress thrips populations by enhancing predator populations, creating barriers that prevent larvae from accessing the soil, and lowering soil temperatures slowing thrips development and population increase. 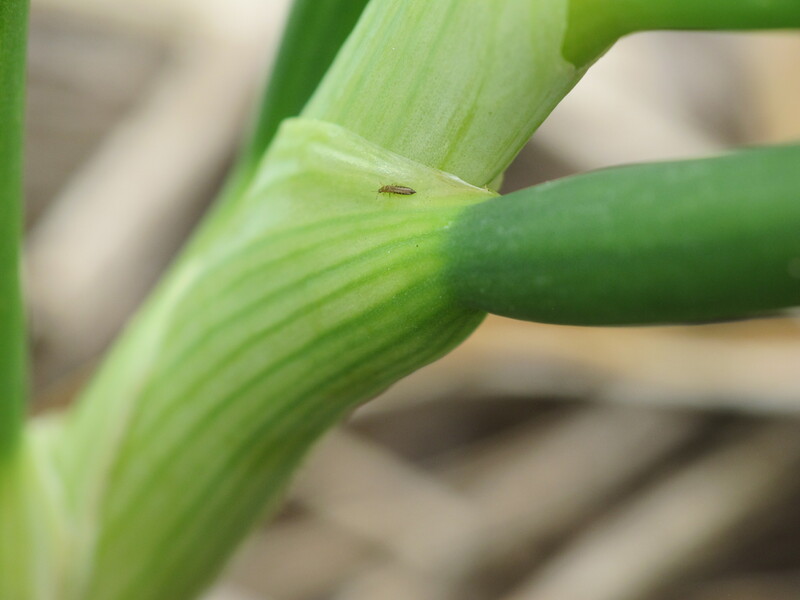 Use trap crops planted in small strips or patches within an onion field to attract thrips where they can then be disked under or sprayed with an insecticide when their populations increase. 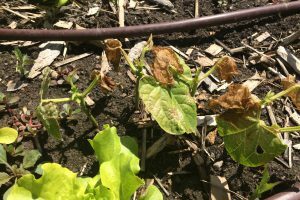 Use overhead sprinkler irrigation to reduce thrips populations by physically washing them from plants and creating a soil surface crust. Plant tolerant onion varieties such as highly tolerant ‘White Keeper’, and moderately tolerant ‘El Charro’, ‘Snow White’, ‘Vega’, ‘X201’, and ‘Zapotec’. Insecticides are most effective when used in conjunction with other management practices as described above. 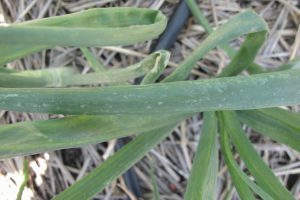 Onion thrips have rapidly developed resistance to several classes of insecticides, including organophosphates, synthetic pyrethroids, and carbamates. 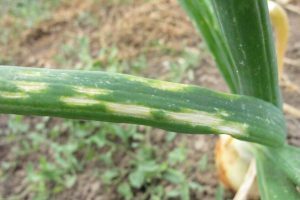 Natural enemies of onion thrips include banded thrips, big-eyed bug, minute pirate bug, green lacewing larvae, and predaceous mites. 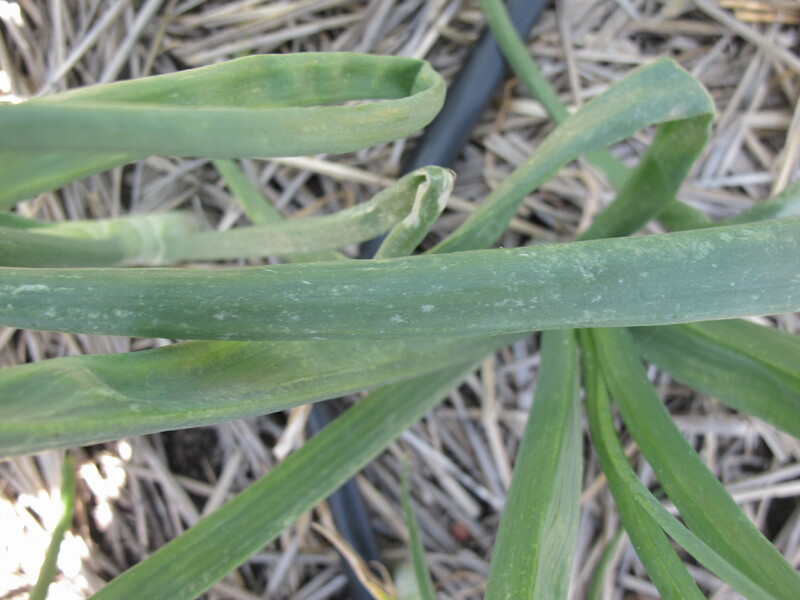 These predators, however, are usually not abundant in onion fields until late in the summer when most thrips feeding damage is already done. 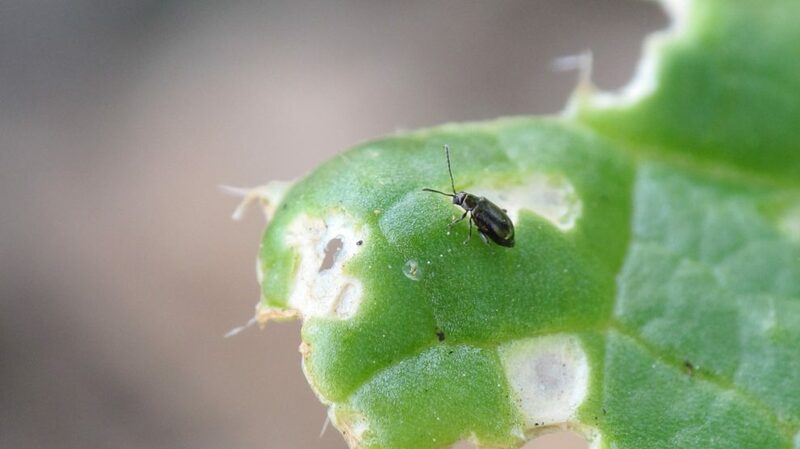 Flea beetles are active and adults have been seen feeding on seedlings and young plants. 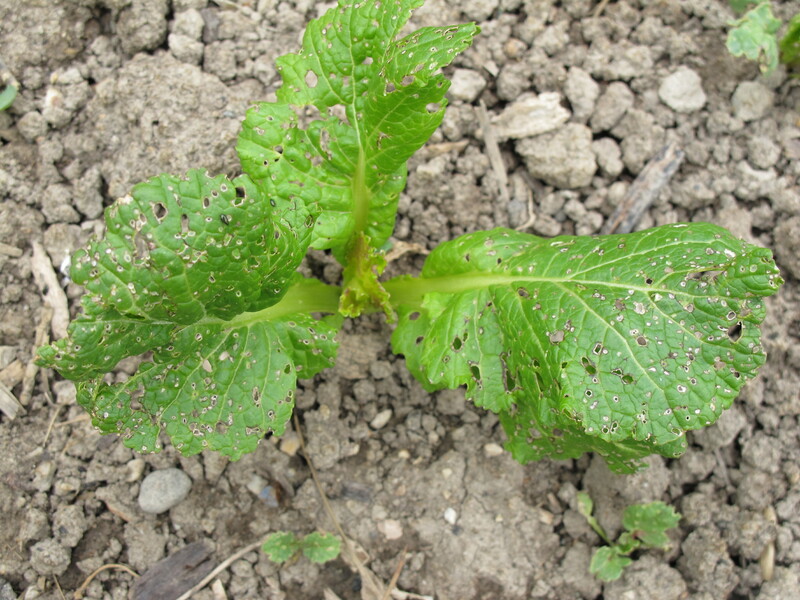 Plants less tolerant to flea beetle damage include cole crops, edible greens, and seedlings (tomato, pepper, turnip). 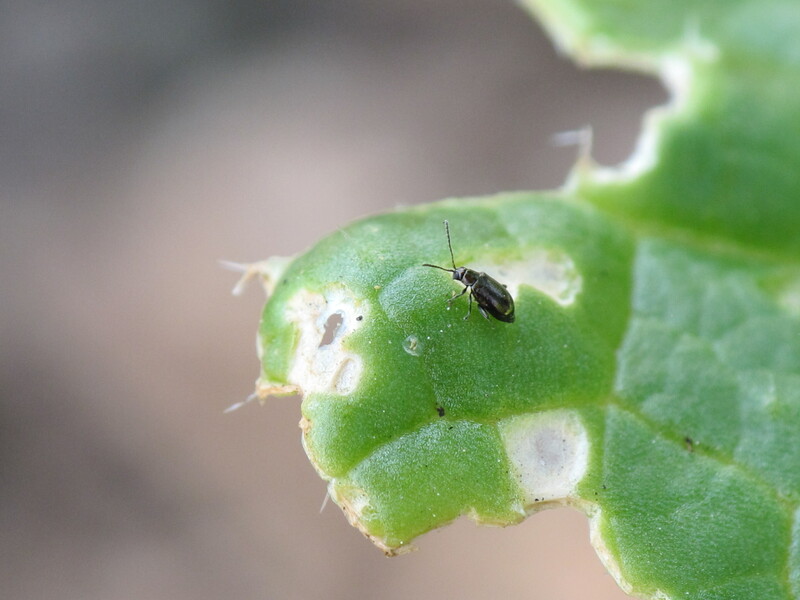 Most flea beetle damage is caused by adult flea beetles and occurs as shallow pits and small rounded, irregular, holes in the foliage, cotyledons, and stems of host plants. Watch young plants and transplants. Treatment thresholds vary from crop to crop. 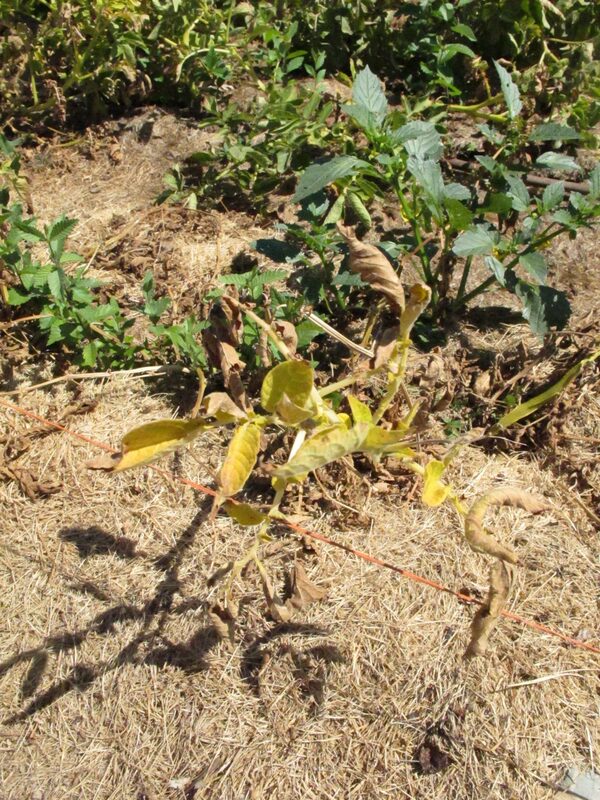 The threshold for tomato is when leaves are 30% defoliated. 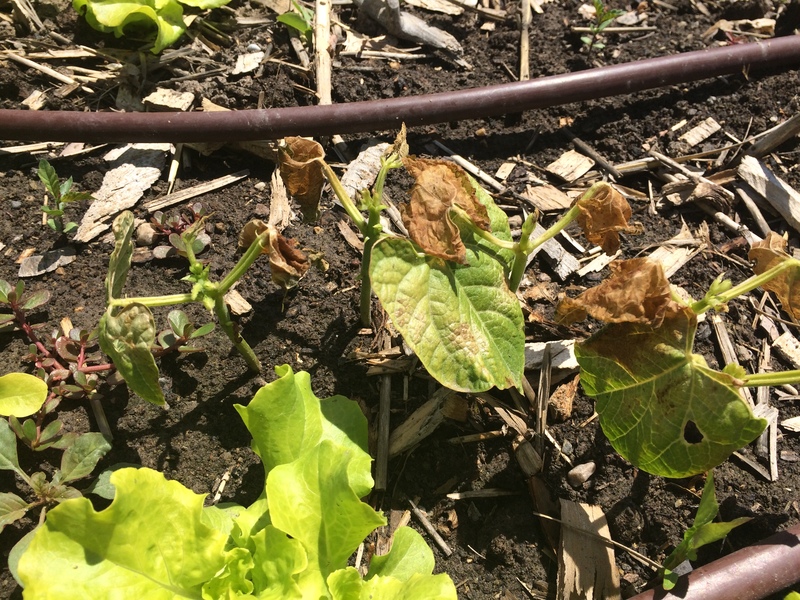 Eggplants should be treated when there is an average of 4 beetles per plant. Crucifers do not have a specific threshold, but treatment may be considered when considerable damage starts to show. UDAF reports that in general, grasshopper populations will be lower this year, but anticipates localized outbreaks. 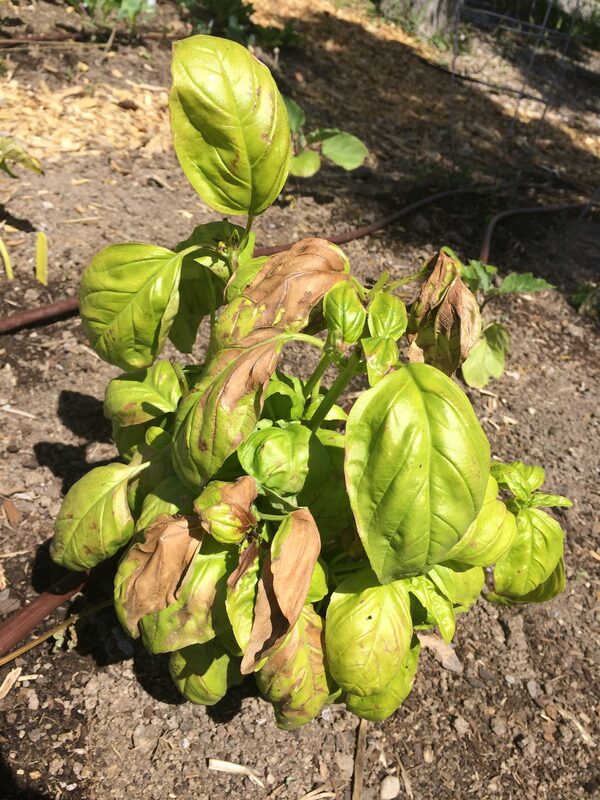 As a result of the late May cold temperatures, tender vegetables such as potatoes, tomatoes, and basil may have suffered from leaf scorch, browning, and even total plant death. But don’t give up. Many plants can be surprisingly resilient and may recover. 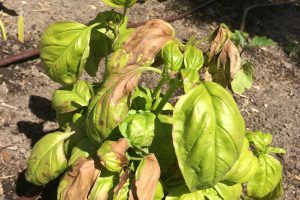 If the plant is of high value or it is not essential to fill the gap, consider leaving the damaged plant in the ground until mid-summer. If no re-growth has appeared by then, replace the plant.